It's quite a thing to see one of the Benedictine Values personified. Twelve years ago, I met with a colleague to discuss benefactors in Colorado. Among the Johnnies he suggested I meet, Bob Simons '52 and his wife Anne were high on that list. He mentioned that Bob was great guy who had made a generous provision in his estate plan for Saint John's. A month later I had breakfast with Bob near his home in Castle Rock, Colo. Bob was small in stature, had a firm handshake and prayed before we ate. We spent two excellent hours getting to know one another. Bob grew up in small-town South Dakota in a family of modest means to which a college education was of high priority. On a late summer trip recommended by a fellow South Dakotan, Bob traveled to Collegeville to meet the monks about whether his family could afford SJU. As in countless similar stories told over the years, the message Bob received was that he should start school and they would work out the details later. Bob studied English, ran track and thought that a career in teaching and coaching might be the best route for him. Upon graduation Bob set off down that path, only to realize a few years in that teaching wasn't his true calling. During his discernment process he met the love of his life, Anne, who was from France and had immigrated to the United States during World War II. It didn't take long for them to fall in love and get married. The couple moved to Denver, where Bob worked for a government agency and Anne worked at a bank. In order to save money, they served as the supers in the apartment complex in which they lived. They made sure tenants lived in a nice, clean and functional building. The owner of the building approached them about whether they might want to buy the building from him. They worked out a payment plan and several years before Denver exploded in population growth and development, Bob and Anne became owners of the property. As time passed their equity grew and the building appreciated rapidly with Denver's hyper-speed growth. They eventually sold that building and invested in a couple of larger properties. During the Great Recession, Bob and Anne found themselves working harder than ever to keep their new properties in business. At that first breakfast I commented presumptuously about his longtime loyalty to SJU. Bob said that it really wasn't until his 50th reunion that he reconnected with his alma mater. 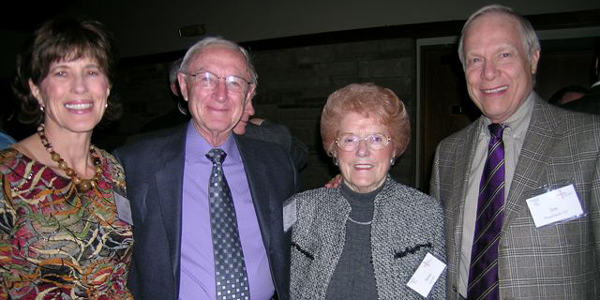 From then on, however, and until his passing in 2016, Bob and Anne (who died in 2013) were regular attendees at alumni events in Denver as well as each five-year reunion since his 50th. Not having children of their own, SJU alumni had become their family. Previous to my meeting Bob, former SJU President Br. Dietrich Reinhart '71, OSB had gotten to know Bob and Anne very well and at one point asked Bob if we could rename Engel Hall "Simons Hall." Br. Dietrich hoped that such a move might one day attract those wishing to honor their parents and families. This was a hard sell. Bob and Anne were very humble and it took a few conversations before they relented and accepted the idea. Over the next 10 years, whenever I met with Bob over breakfast, lunch, dinner or when I stayed at his house, he asked me if we could take his name off the building yet. From his standpoint, Br. Dietrich's idea had worked - Sexton Arena, McKeown Center, Becker Park - and he was ready to once again be humbly anonymous. Politely, I informed Bob that we weren't going to do that and thanked him and Anne again for their generosity. We all miss Bob and Anne a great deal. But the impact they made on Saint John's will last a lifetime.